In this article, I’m going to explain, in my biased perspective, why INFJs make the best editors. The I or E duality—introverted or extroverted—that denotes how the individual is prone to interacting with others based on their inward or outward focus. The S or N duality—sense or intuition—that describes how the individual takes and processes information. The T or F duality—thinking or feeling—that indicates whether the individual makes decisions based on reason vs. empathy. The J or P duality—judging or perceiving—which explores how an individual manifests action and makes decisions. According to the Readers Digest, INFJ is the rarest of the Myers-Briggs personality types, making up only 1.5% of the population. Perhaps it’s the odd paradox between the NF combination that breeds idealism vs. the IJ combination that allows for a seemingly practical and pragmatic approach to everything. It could also be that the INFJ is simultaneously able to see the big picture and feel deeply on an individual level, caring both for humanity as a whole and a single person within it. It’s also strange that an INFJ may come off as extroverted because of the ease of which they are able to empathize and communicate with others (in certain contexts, anyway). Overall, INFJ is an enigma. So who are they really? 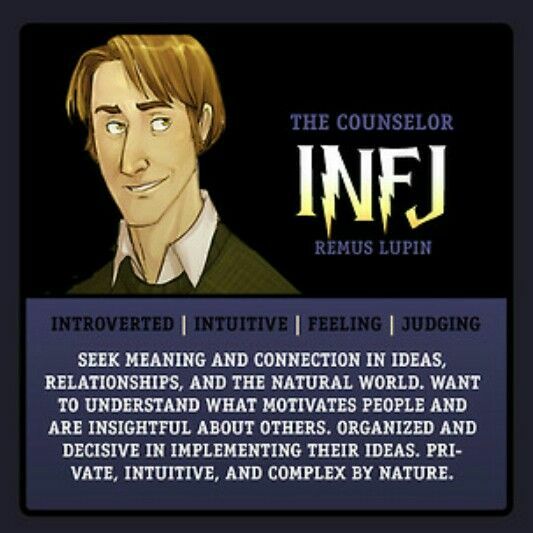 The INFJ is inwardly focused and can often be described as reserved. Due to their aptitude for connecting with people, INFJs are often confused for being extroverted, but they nonetheless draw strength from inside themselves, leaving room in their day to contemplate. Often, they don’t like to be the center of attention, either, choosing to observe or connect with someone one-on-one rather than in a group. Rather than being literal, INFJs take in information on an intuitive level, imagining possibilities, connecting ideas, and seeing the big picture. They’re often very poetic and idealistic with their perception of the world, yet (because of the J) they can be very “Type A” when it comes to how things “should” be. With the feeling trait, INFJs are warm, empathetic, and extremely personable. They come from a value- or moral-oriented standpoint and want to please others or improve the world by effecting change on an individual level. INFJs live their lives based on rules, efficiency, and calculation. They tend to be organized, insightful, and dependable, weighing options based on their judgments of the information they take in. The above are in good company with the following people in the realm of fiction: Jon Snow, Remus Lupin, and Obi-Wan Kenobi. Why Are INFJs the Perfect Editors? 1. We won’t be out partying instead of working on your novel. Not that your editor’s personal life is your concern, but INFJs draw strength from inside, which means we tend to prefer staying at home than hitting the social circuit. Fast turnaround times ftw! 2. In fact, our modus operandi is quiet and thoughtful. Can you think of a better situation for this inclination than sitting in front of a novel and thinking, “Does this work?” without ever saying a word? Me neither. The service they provide to you is more than a job; it’s their natural state of being. INFJs aren’t so antisocial that we can’t funciton. We love building deep relationships, and as editors, we highly value the intimate but professional author/editor working relationship. 4. We won’t spill your secrets *ahem* intellectual property. The bond INFJ editors have with authors is super sacred. Plus, INFJs aren’t outgoing enough to blab around. 5. You get the benefit of a dreamer’s mind and the Director of Operations’s efficiency. The combo of NF makes for poetic, dreamy musings, ripe with creativity. Our J, however, tells us, “This is how it’s got to be,” making us very precise and efficient. Imagine reaping the benefits of someone who is on your wavelength and “just gets you” but is also totally okay with holding you accountable. 6. We see the big picture and the small details. Whether it’s how well your cast of 15 characters play together in an omniscient POV or whether that apostrophe is wrong, an INFJ will have your back. 7. There are rules, man. The J side of our personality can easily detect plot holes, inconsistencies in logic, and other issues that might be on the subtle side. All of this is extremely important for holding up the plausible structure of your fantasy world no matter how imaginative or close to real life it may be. 8. Your feelings are important to us. An INFJ editor isn’t a rude grammar Nazi. Edits are performed with you in mind, and all feedback is constructive and level because INFJs are empathetic and sensitive. 9. Interpersonal relationships are our thing. With the I and the F, we understand people, and we apply that understanding to your characters. 10. We give great advice. They call us “counselors” for a reason. 11. We just want you to succeed. We’re invested in our authors, the relationships we have with our authors, and our authors’ best interests. Consider us a fierce advocate. But, in all seriousness and regardless of what Myers-Briggs personality type is (because who bases their business decisions on this? ), the editor you choose for your novel should be as passionate about the craft as you are and sensitive to your unique needs as a writer. From there, you can develop an amazing partnership on your writing (and publishing) journeys. Next Post How Much Does a Book Editor Cost? Amanda wants to take the intimidation out of the editing process and loves helping authors bring their stories to life. More about Amanda coming soon. All content copyright Amanda Edens 2019.